The Portland Historic Landmarks Commission voted to approve the landmark designation of Washington High School on January 14, 2013. This designation is the first step in Venerable’s ultimate goal of rehabilitating the 1923 brick building. Landmark designation brings with it local incentives for historic preservation, in addition to further regulation including historic design review and restrictions against demolition. The designation document makes a strong case for Washington High School local significance, as the property helps tell the story of Portland’s changing education system during the first half of the 20th century. This period was marked by the need for expanded school facilities; growing concerns around health and safety, with a particular focus on fire prevention; and school designs that offered optimal learning environments as espoused by education experts at the time. The construction of Washington High School began in 1923 after a fire destroyed much of the 1906 Washington High School in the year prior. The new building fully utilized “fireproof” construction techniques of the time. It is a significant example of a building constructed with a structural system entirely of concrete including slabs, columns, and beams. The exterior was faced with red brick and the walls were constructed of plaster-cement-finished clay masonry. There is very little wood in the building. Even the stairs and flooring are concrete. 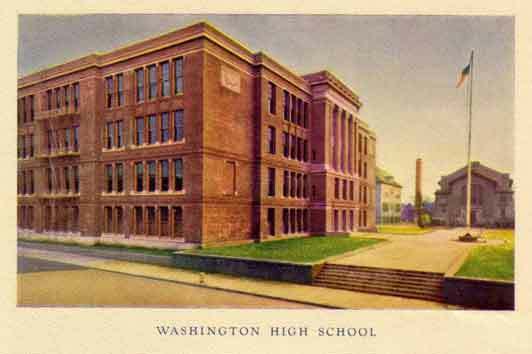 The new Washington High School was constructed amidst an established campus of buildings that included the original Hawthorne School (1897-1900, demolished), Manual Training Building (1908, demolished), Gymnasium (1911, demolished) and a Boiler Building (1912, extant). Construction was completed and Washington High School opened its doors to students in 1924. The Washington High School campus was and still is a prominent feature in the Buckman neighborhood. Buckman is a dense early-20th-Century streetcar suburb that grew significantly in response to the building of bridges over the Willamette River, the development of streetcar lines that connected to downtown Portland, and the population explosion that occurred as a result of the 1905 Lewis and Clark Centennial Exposition. Buckman was home to a rapidly growing middle class in Portland, which included families with school-age children. The 1906 Washington High School was an immediate response to Buckman’s changing demographics. The 1924 Washington High School continued the tradition of a landmark building at the corner of SE Stark and Morrison after the former school burned, further expanding capacity while incorporating design principles idealized at the time. Namely, it was organized around a central auditorium and had many specialized spaces included a library, science labs, music room, and cafeteria. In addition, Washington High School also maintains one of the most substantial compositions of Classical Revival detailing on Portland’s eastside, as evidenced in the symmetry of windows and vertical elements, Classical details and reliefs in terra cotta, and a monumental entrance vestibule. It is interesting to note that the classical symmetry of the exterior maintains such primacy that stairwell landings occur in the middle of window openings. The inspirational quality of the Classical Revival design is further enhanced by six quotes featured on the building exterior in glazed terra cotta panels. The building’s large twelve-over-one wood windows are not only a key feature of the architect’s Classical composition, but the windows are clustered in groups of three or four to optimize the amount of daylight that could enter each classroom space. “Breeze shields” are found in the classrooms, which could be placed in front of an open window, forcing the airflow in an upward direction rather than horizontally across a desk. Washington High School’s significance as a Classical Revival high school is not only a reflection of the ideals of educational facility design during this period, but reflects the expertise of its architects Luther Lee Dougan and Chester A. Houghtaling. While the first Washington High School featured Romanesque design influences, Houghtaling & Dougan pursued the more monumental Classical Revival style for the building’s replacement—a style they had executed previously in Portland with much success. Portland Public Schools hired Houghtaling & Dougan because they were without a district architect during the time period of 1920 to 1924. Floyd A. Naramore had recently resigned in 1919 to work as Seattle’s school architect. He was originally hired in 1912 when the District recognized the need for in-house expertise to deal with the design of fireproof masonry buildings. In the aftermath of Naramore’s departure, Portland Public Schools had to briefly rely on outside architects to design and manage much of the new construction, including Washington High School. The firm Houghtaling & Dougan was considered to be a versatile team and they designed many different types of buildings ranging from industrial warehouses to schools to major civic buildings such as the Elks Temple. In 1978, Washington High School merged with Monroe High School—an all-girls polytechnic sister school to Benson Polytechnic High School—and the school then became known as Washington-Monroe High School. Not long after, the school experienced declining enrollment and closed its doors in 1981. Two years later the facility was reopened as the Children’s Service Center. This multipurpose facility served multiple tenants that included a day care center, a vocational program for Native American youth and the district’s continuing education center for at-risk pregnant girls. The Children’s Service Center closed in the 1990s and the building has been largely vacant since that time. 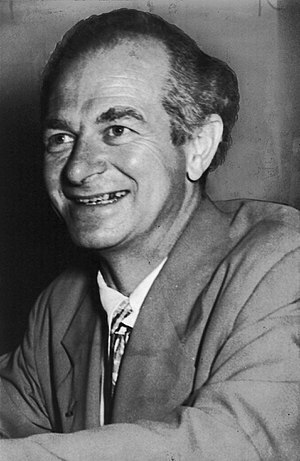 Notable alumni of Washington High School include Steven G. Bradbury, attorney, United State Department of Justice; Bill Naito, longtime Portland businessman and civic leader; and Linus Pauling, two-time Nobel Prize winner. Pauling was awarded his diploma in 1962, 45 years after leaving Washington High School prior to graduating in order to attend Oregon State University.